Lacey was on her knees. The rabbit screamed, pinned under her claw-like grip. Lacey’s lips were drawn back, fangs exposed, mouth thrusting toward the pitiful creature. She jerked her hands away, and sat back. Pine trees surrounded her, their bare trunks like stilts holding the thick canopy high above. Hardly any light filtered down through the dense criss-crossing of boughs and needles. “Where am I?” she whispered. But Lacey knew where she was. The Wish Wood. She got up slowly, as if just being here was going to bring a lightning bolt down on her head. When nothing happened she examined her tracks on the ground, walking outward in a circle. If she hurried she could follow them back home, before something did happen. But her rabbit chase had been erratic. The forest floor was churned up everywhere and she was losing light. The sun must be setting, it was hard to tell under the canopy. Riley said street lamps and night-lights had spoiled her—night in the wilds was darker than she could imagine. Lacey came back to where she had started. The rabbit still lay on its side. Was it dead? She nudged it with her foot. The rabbit blinked, twitched it’s nose, and hopped up. It regarded her for a moment, then thumped once and dashed off. It knew exactly where it was going. Lacey was lost. Mama was going to be furious. Maybe Ella was still at the Green, hunting for daisies, not even noticing Lacey was gone. Maybe Lacey could make it back in time to take her home, like nothing had happened. But which way was home? The sun’s dying light didn’t seem to be coming from any particular direction. Lacey strained her ears. She couldn’t hear the river or any sounds from the Village. How far had she come? The only direction Lacey knew was which way the rabbit had gone. But the rabbit had already led her away from home once. Maybe she should go in the opposite direction? There were no bushes or underbrush here. The forest floor was bare except for dirt and pine needles. No wood to burn in a campfire, even if she had a way to light one. No food. Nothing alive, except the trees. She held her breath, and tried to quiet her pounding heart, listening as hard as she could for something that would give her a clue. But there was nothing. Even the forest was silent, like it was holding its breath too. Lacey’s ears were useless. What good was being part bat if she couldn’t even use her senses to find her way home? The rabbit’s senses would take it home—to green grasses and shelter, like the cottonwoods where the underbrush was thick, and the Wish Wood ended. She should follow the rabbit. The shadows were deepening and she started imagining faces in the craggy trunks that loomed over her. Panic started to creep up her spine. She rubbed her arms and hugged her cloak tight against a sudden chill. Her imagination convinced her that something was behind her—reaching for her. Lacey spun around, then spun back, as her imagination moved the location of the something. The colors of the forest bled together into gray, and then darkness. Lacey had been walking in the direction of the rabbit for an hour, maybe more. At least, she thought it was the same direction. It didn’t matter. By now, she knew it was the wrong direction. She couldn’t backtrack. There was no point. She walked with her arms outstretched, feeling her way around the tree trunks. It was as dark as Riley had promised. Possibly more. She kept her eyes wide—as wide as she could make them without her eyeballs popping out of her head. It wasn’t any different from walking with her eyes shut. She kept them open anyway. The forest was alive with sounds now: hoots, scratches, and chitters. She heard a squeal, which ended abruptly as a hunter found it’s prey. But that was all very far away, in the canopy above. Around her the silence pressed in. The crack of twigs beneath her feet seemed almost like a violation of a secret taboo. Lacey hadn’t spent a night outside the Village since the day Mama brought her home from the Wood, when she was a newly made human girl of six years old. She tried to pretend it was her initiation night with the hunters. She imagined that just ahead was a warm campfire where friends would clap her on the back. But she couldn’t hold on to the fantasy. It was Devan’s initiation night, not hers. Devan was sitting at that friendly campfire, and all she had was cold dark reality. Lacey held on to the slim hope than she would suddenly break through the trees into the street by the bakery. But her hope was draining away as quickly as the Wood was plunging into the depths of cold that a fall night could bring. She thought about stopping and huddling for warmth inside her cloak, but she refused to lay down in defeat. It wasn’t bravery that kept her from doing it. Mostly, she was afraid something would crawl on her in the dark. After more walking and fumbling, she began to feel like something else was in the darkness with her. With each of her clumsy frustrated steps, she was sure she heard another. A softer, more careful, step. Lacey felt a growing certainty of a solid presence behind her. She spun around. Was that a small pooling of the dark, where the empty nothing became…something? Was that the sound of a breath to her left? Lacey’s head snapped left—right. Then she spun again. It was coming for her! The thing that made people disappear, or go crazy—the thing that haunted the Wood. She was sure of it. She ran, stumbled, and slammed into a tree with her whole body. The breath was knocked out of her and fresh pain exploded where her bruised cheek hit wood, but she rolled forward around the trunk and kept running, desperate to get away. She held her hands up in front of her again, fending off trees. Her shoulders jarred, as her palms hit unmoving trees, and her knuckles scraped against rough bark, over and over. Soon her hands were wet and sticky, either from blood or sap, or both. Lacey thought she heard a whisper beckoning her forward. There were no words, but if there had been they would have been: safety, refuge, light, warmth—come. Everything she wanted or needed was ahead. If she kept going, she would make it. She careened toward the call. Running and running. But it felt wrong. She was being hunted by something behind her. Whatever it was could have finished her by now, but instead she was being herded. The promise of safety was a trap. Fury took over. She was not prey! She stopped and turned to face her hunter. Except for her ragged breath and thudding heart, there was only quiet. She waited. Her imagination ran wild, but Lacey stood her ground. High above, a tiny bit of the darkness began to glow. It was the night moon behind clouds. The clouds thinned until they broke apart, revealing Eridan's smaller white moon, which became full near midnight this time of year. The light was pale and weak, but compared to the dark it was as bright as the sun. There was a small clearing in front of her. Silver tree trunks cast shadows across the forest floor, where pine needles gleamed like splinters of bone. Across the clearing, a shadow moved. She only saw it for a heartbeat, before it melted back into the other shadows. It seemed enormous, and she hoped that was just a trick of the light. Lacey kept her eyes fixed on the spot it had disappeared. It would have to wade through a lake of moonlight if it wanted to come after her. She would see it coming. A thick fallen branch lay on the ground a few feet into the clearing. She crouched down slowly, not taking her eyes off the spot she’d last seen the shadow. She groped the forest floor, pine needles poking into the cuts on her hands. She couldn’t quite reach the branch without exposing herself in the light of the clearing. But she needed a weapon, so she thrust forward. Her skin glowed like a beacon in the moonlight, but before she could pick up her weapon and hide herself again, she heard a whine, like a confused dog, directly behind her. She scrambled to turn around, and ended up falling on her backside. Her hunter had circled around. She was trapped and exposed. The branch was beside her and she grabbed for it. It disintegrated in her hands. Rotten. Just a collection of soggy splinters held together by a skin of bark. She threw it at her hunter, and it made a useless splat. The beast padded forward on four paws, moonlight slowly peeling back the curtain of shadow, revealing the face of her hunter. The enormous white-fanged face of a wolf. She picked herself up off the ground, determined to meet her end as its equal. As she stood up, so did the wolf—from four legs to two. It towered above her, by a whole head and shoulders. Its front paws were actually clawed hands. Its shoulders hunched awkwardly around its ears, as though it was not quite sure what to do with them. The moonlight had been playing tricks; the face of her hunter was not exactly that of a wolf. His snout was shorter than it should be, though still full of an impressive set of wolf teeth. The fur that covered his snout and ears, thinned to a slight down on the rest of his face. He had a thick mop of hair on top of his head, but his neck and shoulders were bare. His eyes were the most startling. They were blue, and puzzled. And human. He looked as baffled as she was. “You’re like me!” she blurted. 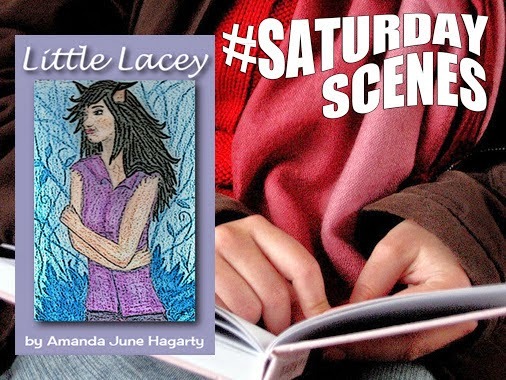 Authors Note: Thank you for reading my entry for the first #saturdayscenes. If you enjoyed this chapter of my book you can read more on Wattpad.